The Meethotamulla tragedy has brought back the politics of garbage to every screen, newspaper and radio. Street protests are happening around every garbage dump. Modern day popular communication technologies have taken over and they broadcast/stream live coverage of the tragedy with first-hand information and drama. There is ample blame being apportioned on the current Government and regretfully, most of the current politiciansincluding those who oppose Government policieshave been theelite that governedduring the last three decades when garbage was piling up all over Sri Lanka. Like everything else in our beautiful land, the tragedy of 32 deaths has become the propelling slogan for the ‘unfocused’ or visionless Opposition. Their dying Central Bank scandal theme is being replaced by the “kunukanda”. It is indeed a joke that Udaya Gammanpila is chastising his former partner-in-crime Minister Champika Ranawaka for the environmental disaster, when he himself held the position of Chairman of the Central Environmental Authority. Dinesh Gunawardene, one of the sons of Philip Gunawardena, the Lion of Boralugoda, castigates the Government for not resolving the garbage issue when his own brother wasthe Mayor of Colombo in 2002. The hypocrisy of the political bankruptcy of current-day politicians needs no further evidence. It is sensational slogans and not the country’s progress that matter to these failing politicians. The Janatha Vimukthi Peramuna (JVP) is probably still on Avurudu mood as we have not seen them on the streets yet. It may be that the Meethotamulla victims are just a few hundred families and don’t mean much as a vote basefor them, but for the Joint Opposition, it’s a slogan generating opportunity. Garbage could be turned into amuch more productive commodity than our political hypocrites. Garbage could be worth its weight in gold for the environment if recycled but it has been prevented due to the corruption of the political mafiathat controls it. This waste could also take us towards a green economy that will save our environment and agriculture, helping us to produce the much sought after organic foods. The tug-of-war to apportion blame for refusing the many offers of support from various countries to manage and recycle the waste has become the breaking news in media. 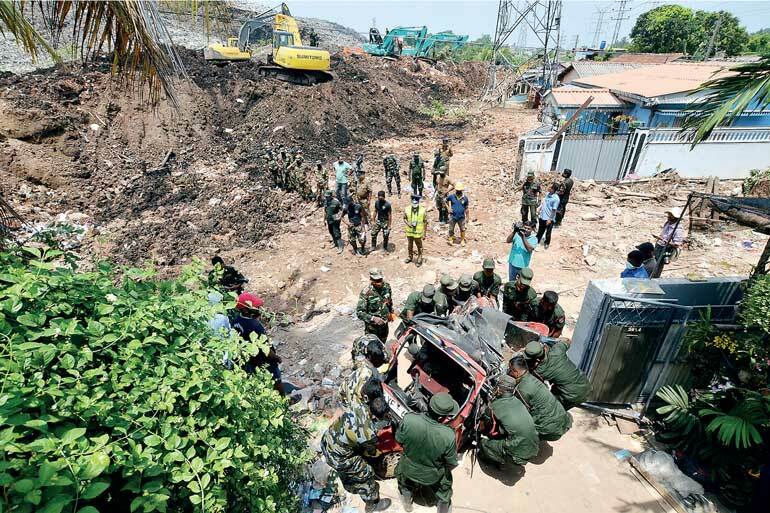 We also heard of huge corruption in recent mediareports that Meethotamulla had a number of backhoes in operation 24 hours a day at the rate of Rs.8,000/hour, amounting to a cool Rs. 70,080,000 per backhoe per year. The cost of a brand new backhoe is probably in the region of $ 85,000 or Rs. 12,750,000. That means Meethotamulla could buyat least five backhoes for the price paid to hire one during a year. This again shows how dirty and corrupt our politicians could become even in managing dirt. Theworld’s best Finance Minister and the Municipal Council should start counting the figures before money is being spent on hiring backhoes through their party henchmen. No wonder, the few politicians who tried to visit Meethotamulla were booedat, and fortunately not thrown to the garbage dump. President Sirisena once again dismisses everything his Government has committed. Earlier, it was announced that each damaged house could claim up to 2.5 million and each of the dead persons would be compensated with 100,000 along with funeral expenses. Now he retracts that decision, saying there was no such decision by the Government. Is there any minister or administrative officer who can commit to spend such a large amount of State funds without Cabinet or Parliamentary approval? Isn’t it hypocritical for the President to sit as the Head of the Cabinet, sign off on the decision, return onmedia and say no such decision wasmade? Is he playing a game of cheap politics? Garbage is an insurmountable problem in every nation across the world. The smoky mountain in Manila, Philippines or the Favela of Rio de Janeiro in Brazil are good examples of the good, bad and the ugly of garbage and slum dwelling. While millions survive on garbage, millions die too due to the sanitary hell they live in. The garbage dumps in many developing or less developed countries have thousandsself-employed in recycling waste. Little children swarm on the dirt carrying trucks to pick up plastic, iron, paper and whatever is recyclable. They even consume discarded scraps of food they can find. While this informal industry cleans up most of the waste, unfortunately, the hard to decay plastic (like sirisiri bags) are left behind and will remain in its present form for many years. The Three Rs, Reduce, Reuse and Recycle, all help to cut down on the amount of waste we throw away. They conserve natural resources, landfill space, and energy. The concept is nothing new to rural Sri Lanka. In the absence of garbage collection by local authorities in remote areas, it is often dumped in a pit at the back of the house. In time, these rural folk, who are mainly engaged in agriculture, have realised the potential of producing their own manure. Of course, when we progress, machines take over clearing of waste, and space has become the biggest problem for dumping waste. With the ever-growing population, there is very little space to dump all the garbage we produce. The city of Colombo has a population of approximately550,000 inhabitants. There is a daily floating population of approximately another 500,000 and Colombo collects waste of 1.1 million people daily. If you take the district of Colombo, the figure is three million people. The estimated waste collected is 800 metric tons. Do we have enough dumping space in Colombo for all the waste that is generated? From where does the floating population come?Who contributes to half the waste generated in Colombo? They are the migrant workers from the suburbs who daily commute to Colombo. They are the ones who are now challenging the movement of waste from Colombo to the suburbs. At least 80% of the garbage that gets collected in the dumps could be productively recycled. They could create high value through the production of bio gas that could be used for motor vehicles and cooking, produce all the fertilisers locally without importing the kidney failure causing chemical fertilisers, help produce organic food which is internationally sought after and help increase the bio diversity of the country. This could be a viable environmentally friendly industry for people who are trying to save the environment by ousting humans from their original and rightful homes. The global recycling industry, which has a target of recycling 70% of waste, is a $ 410 billion business.This might trigger some thinking around the entrepreneurial brains to cash in on the garbage. Meethotamulla and all other garbage dumps in the country could be turned to gold by using modern recycling concepts. Further, clean energy fetches a higher price in most countries, and Sri Lanka should follow the same. Maldives forces its tourists to take back their non-recyclable waste back with them to their home countries. It is a welcome sight to see airlines handing over refuse bags to its passengers and the waste is carried back free of charge. Colombo too may have to start a similar project to the large migrant population that visits the city daily. If the residents follow the 3R concept, we may be able to address this garbage menace more effectively. The Government needs to implement long-term strategies that would ensure garbage would be managed professionally from the time of collection to the recycling process and final dumping. Towards this, if the garbage at the source follows the 3R concept (Reduce, Reuse and Recycle), we may be able to address this garbage menace more effectively. This is a process where all citizens of Sri Lanka need to commit to their share of social and environmental responsibility.